Long Read: Chuma Nwokolo - Superstate Africa: Kenya, Somaliland, and the Ghost of Biafra Past. 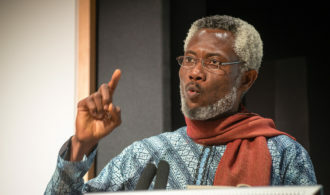 Chuma Nwokolo gave a lecture “Superstate Africa: Kenya, Somaliland, and the Ghost of Biafra Past” at the Rift Valley Institute on September 28, 2017 as part of Storymoja Festival 2017. That festival was celebrating its tenth anniversary and had the theme of “Black Peace”. Chuma is the author of many books the most recent of which is The Extinction of The Menai. At the end of the lecture, he had a conversation with the audience moderated by blogger and journalist James Murua. Here is the lecture in full. Next week, the world will gather in my hometown, Asaba, to commemorate the fiftieth anniversary of a Biafran war massacre. Asaba is an Igbo town originally in the old Western Region of Nigeria, a predominantly Yoruba region. In that sense, like Somalis stranded in Kenya’s northern frontiers, we automatically ticked the minority box by the sleight of a colonial mapmaker. So when the Biafran war broke out, Asaba was not part of the seceding Eastern Region. But this did not prevent the 2nd Division of the Nigerian Army led by Murtala Mohammed from rounding up the male civilian population in the town square. From elders to teenagers, from university professors to bricklayers, my people had come out in ceremonial white to welcome their army with chants of ‘One Nigeria’. There, in Ogbe Osowa, over seven hundred unarmed boys and men were murdered in cold blood on the 7th of October, 1967 in one of the forgotten atrocities of the war. My father, 34-year-old at the time, was one of the victims. He took a bullet in the chest and survived only by playing dead in a field of corpses until – under cover of night – he was able to crawl from the killing field and into hiding. I was too young for the death parade. As a three-year-old I was strapped to my mother’s back for the next few days as she turned over bloated corpses searching for her husband’s body for burial. My family is among the lucky ones. My father survived to raise his children, but although we were best of friends until he died in his seventies, he was too traumatized to tell me his war story, sealed under that scar in his back. That he left to his wife, my mother. I started this paper on a personal note because for all of us, Africa is personal. We all have our own stories, each just as poignant, just as valid as the other’s. I have visited Boko Haram camps and ravaged villages, speaking to children who will one day carry the burden I carry today. Last month, I was a guest of a brilliant cultural initiative, the Hargeisa International Book Fair. The most outstanding feature of the Somalilander is their patriotism, perhaps inspired by having to fight so hard for a nationhood that the rest of the world can take for granted, as symbolised for me by the sight of an elderly Somalilander dancing spontaneously to their (undeniably danceable) national anthem. One day, I returned to my hotel in Hargeisa close to midnight to find a young waiter alone in the restaurant, watching a youtube video of the 1992 war of liberation on his phone. His father had fought with the Somali National Movement against the Siad Barre regime in Mogadishu, and he shared a video with me about that history, and about his passionate identification with his fledgling nation. I asked him about the prospects of reconciliation, of a greater Somalia. Never, he said, his face registering all the pain, all the wounds of a war he did not personally experience. In Kenya, with her 38 million people spread over 44 ethnic nations, it was always clear that while tribalism remains a feature, certain offices like the Presidency was always going to be a preserve of the major ethnic groups. After the post-electoral violence of 2007/8 and the devolved constitution of 2010, I remember conversations with Kenyan friends who felt that the devolved government was the portal for the Kenya of the future. They were soon disillusioned. What soon became clear was that corruption had also devolved with surgical precision, and then of course the inconclusive national elections of 2017 happened. For me, the most telling moment in the entire election cycle was a news story that President Uhuru and his main challenger, Raila Odinga were reporting each other to the African Union. We shall come back to this later. In Nigeria, like that Somali waiter, tens of thousands of young people still identify with the inchoate state of Biafra. Recently there was an interaction between soldiers of the Nigerian army and young IPOB (Independent Peoples of Biafra) supporters that left dozens of civilians dead. Young men with dreams and futures ahead of them, slaughtered in the mud. Fifty years after the war, the fires of disaffection still rage, the ghost of Biafra still stalks, not just Nigeria, Somaliland and Kenya, but the whole of Africa. As nations forged in the furnace of bad governance, Somaliland and Biafra share some things in common. In 1966, tens of thousands of Igbos were murdered in the northern region of Nigeria. Nobody was prosecuted and punished for these crimes, leading to an exodus of Easterners and a declaration of secession. Three years later, a million Igbos were dead. In Somalia, the carpet bombing of the civilian population by Siad Barre, destroyed 95% of Hargeisa. Biafra and Somaliland suffered oppression at the hands of their governments of the day, but this was where their fortunes diverged, for while Biafra won the recognition of five countries (Sierra Leone, Tanzania, Gabon, Zambia and Haiti), they lost the military war. Somaliland on the other hand won the military war in 1992, but (despite several cycles of democratic presidential elections) are yet to win any formal state recognition. Let us start by defining our central term: SuperState Africa. We keep hearing the punchline, Africa is not a country. But in a world where a navel-gazing American president can summon a claque of Africa presidents to unveil the new African state of Nambia, it is a punchline to an increasingly unsavoury joke. The more relevant question should be: What should Africa be, this continent with millions of miles of alien borders drawn in Berlin? That is where the superstate comes in. A superstate is a larger state that is formed when smaller states unite. A federation of sorts. But for this paper, we can define a superstate without a need for formally uniting, as a continental state with constituent countries whose colonial borders have been constitutionally softened by treaty to enable the superstate’s institutions to mediate between citizens, ethnic peoples and the governmental institutions of the constituent countries. We have two types of History problems in Africa: either we walk in a present shackled to the emotional pain and mental prisons of our past (like my Hargeisa waiter friend), or we fall into present day pits, uninformed by the lessons of our past. To learn properly from our history, we must process the pain of the past so we can live free in the present, and distill the lessons so that we can live triumphantly in the now. As a ten-year-old in the early seventies, I witnessed my first solar eclipse in the company of chickens. I recall how, as the sun returned a minute after ‘nightfall’, our chickens stumbled, confused, from their roosts. They had retired with the fall of darkness and the extremely short ‘night’ left them completely confused. I see the same confusion in our serial inability to relate our current affairs to our knowledge of history. History teaches us that not all darkness is night, yet, we continue in our knee-jerk reflexes, like people without memory. Our intellectual class have engaged in an unfortunate and distractive clamouring for restructuring, as though our problems were fundamentally structural. But as African countries we can save ourselves some aggravation by looking into current affairs and history, by looking across our borders and into our past. At its most cynical, the clamour for restructuring is more jobs for the boys. At its most idealistic, it is a pious hope that kleptomaniac governors, assemblymen and politicians who have been raiding their billion shilling budgets for ever will suddenly become paragons of integrity and transform their regions into a paradise, once they get more constitutional powers and trillion shilling budgets. But we know this will not happen. Because African elections are a little like Musical Chairs for assassins: once the dancer captures a chair, he shoots the DJ and every other dancer silly enough not to flee the room, and spends the rest of his life trying to hang onto power and resources. For instance, Nigerians clamouring for a more federal constitution can look into their history in the early sixties, when they actually ran a more federal constitution and ask themselves how that constitution resulted directly in the civil war and their present dysfunction. They can look into across their borders to Kenya, for instance, which devolved 14 national or federal functions to 47 county councils and interrogate a Transparency International Kenya Poll which found that 59% of Kenyans consider that corruption is the biggest threat to devolution, and the reason why it has failed to make the desired impact. Whether we are moving from Unitary systems to Federal as in 2010 Kenya or from Federal to Unitary, as in 1972 Cameroon, there is still something missing. All my professional life has engaged this question: how can the leviathan powers of state respond to the frangible dreams of the small citizen and the tiny, endangered ethnic nation? This issue engages my newest book, The Extinction of Menai. How can the next civil war in Africa be aborted before the first shot is fired, before the first family is scarred? The answer is simple: Good Governance. Our challenge is to build a society where public service is a challenge rather than a bonanza. Where our youths think: it is our turn to work, rather than: it is our turn to eat. Where our public offices are occupied by public servants not private contractors of godfathers and cliques. The Biafran crisis was precipitated by the murder of over 30,000 Igbos in northern Nigeria. What if the killer of the first Igbo in the north was the second person to die? What if he/she was arrested within hours of the murder, prosecuted within days, and hung within weeks by the simple process of good governance, thereby serving justice to the wounded and warning to future murderers? Would a dozen Igbos have been murdered? Would a thousand? Would a million? Would 900,000 Rwandans have been slaughtered, if good governance held sway? Would Nigeria’s North east have been spared the Boko Haram crisis? What if government actually governed? What if public servants actually worked in the public interest? Before we go much further, let us take a minute to explode the myth of tribalism: the conventional wisdom that tribalism is an intractable part of the African condition. Nothing could be further from the truth, and we can establish this using the English Premiership league. Many years ago when I lived in Oxford I discovered that the British were a particularly tribalistic community who only overcome their seasonal desire to slaughter themselves by parlaying their nihilistic urges onto eleven players and fighting weekly 90-minute tribal wars by proxy. Occasionally though, this desire swamps their control, and you have the football hooligans slugging it out on the streets, but overall, the sophisticated system of controlled tribalism works. Of course these wars have taken on international dimensions so that mercenaries are hired from Brazil to Ivory Coast, with tribesmen adopted from Eldoret to Nakuru. Yet, if we asked a tribalistic anti-immigration, pro-Brexit Manchester City fan, who has never missed a club match in his life if they’d rather have a City team full of Mancunians, which will be relegated, or one full of illegal immigrants which will lift the cup, we will discover the lie of Tribalism. It is the same with us. I will rather have success and good governance than the bragging rights that I have a minister from either hometown of Jos or Asaba in a shambolic country. I will rather have a minister whom I don’t know fix my hometown roads so I can drive my saloon for ten years without changing a shock absorber, than a brother minister who gifts me a spanking new car which won’t last a year because endemic corruption guarantees me a lifetime of unmotorable roads. The problem is that our systems have become so bad that none of the options on offer on election day can actually provide success and good governance, so we often default to the tribal option. But if success and good governance were the alternative to tribalistic choices, we will invariably choose success, like any other premiership league supporter rooting for the purchase of new players, not from their birth tribe, but from among the best talent in the world. In the end, what we desire deep down is a meritocracy: a country that works so well that we don’t need ethnic or other connections to get things done; where things are so fair that we hardly remember the ethnic identity of our president. This is far preferable to a presidency of a corruption-infested, dysfunctional government headed by our kinsman. This leads us to the working conclusion that tribalism is an inarticulate grunt for good governance by prehistoric irredentists who don’t know how to ask for, or obtain good governance. So next time we feel that instinctive hankering for a face from our ethnic nation in high office, let us reject that primordial instinct and work for a system of good governance rather than for a familiar thief in office. Tribalism is not an evil for others to stop. It is a nightmare we decide to wake up from. There is a certain conventional wisdom that the path to Africa’s future of good governance is via ‘Strong Institutions’. According to this conventional wisdom, if we build strong institutions we will have good governance because strong institutions create a culture of rule of law. This conventional wisdom is a lie because of the reality of state capture. A nepotistic president can legally pack a ‘strong’ public service institution with citizens from his village, thereby guaranteeing that for the duration of their civil service careers, those institutions will degenerate to the average intelligence of the president’s village idiots. And those who argue that when we become developed, our institutions will be developed as well, should also remember that even the American Supreme Court can also be captured for a season by any party in power making appointments of judges that guarantee the party ideological outcomes from that court. The same thing obtains at every level of ‘developed society’, from chauvinistic media which have a blind side to the pains of the outsiders, or hawkish imperialism which provokes wars and defence spending to favour war capitalists over the poor and homeless. Today’s clamours for referenda especially for campaigners for self-rule, federalism or autonomy can be guided by Africa’s decent history of referenda. From Eritrea in 1993 to South Sudan in 2011, we know that successful referendum campaigns do not necessarily equate sanguine outcomes. In 1961 the two German trust territories governed as British Cameroons were offered a referendum with two options: Join British Nigeria or Join French Cameroons. Northern Cameroons voted 60% to merge with Nigeria. 233,000 Southern Cameroonians, constituting 70% of their electorate, voted to join Cameroon. Where the Southern Cameroonians right? Was their voice of the People the voice of God? We can ask the 80,000 demonstrators in that region who last week protested the oppression of the 35-year-old government of Paul Biya, who recently set the African record for the longest ever disconnection of an entire region from the internet. Yet, whether in Northern Nigeria being ravaged by Sani Abacha and Boko Haram, or in Western Cameroon, being ravaged by Ahidjo and Biya, what is clear is that the missing, critical, question on the plebiscite of 1961 was: Do You Want Good Governance or Not. If the two options in a referendum are stupid, the public vote will always result in stupidity. A referendum is a plebiscite. It comes from the Latin, Plebs (common People) and scitum (decree). When Kenya was offered a plebiscite to accept or reject a constitution, the good people of Kenya could not by referendum, fix any of the dozen problems in the constitution. They could only say Yes or No. If we wait until the date of the vote to fix our country, we have waited too late. Whether in Eritrea, South Sudan, Cameroon, or indeed Biafra, if good governance is not on the ballot, the result of the referendum is a lie. The sight of decrepit presidents in their eighties and nineties falling asleep in state functions and spending more time in hospitals than in state house has also excited a clamour for more youthfulness in the corridors of power. But power is never donated, and if the youth – who in some countries are as much as 70% of the population – cannot articulate a rudimentary manifesto and organise and evict old dodderers from power, they are probably too incompetent to run a government anyway. In any case, most of the relics in Africa’s state houses attained power in their twenties and thirties. They have merely stayed on due to the pusillanimity of the young lions who are supposed to retire the old when they come into their prime. Today’s youth will likely do the same when their turn comes: unless we first fix the problem of impunity and enthrone good governance. There is no empirical evidence to guarantee that an infusion of youth will, of itself, improve the fate of African nations. Thomas Sankara may have been a young man, but so was Samuel Doe. What we see instead is that those youths who have actually attained the conclave of power have consistently brought their superior energies to the energetic task of looting the commonwealth. Although the road to good governance does requires strong institutions, it is not fundamentally an institutional issue. Although it requires the energies of the youth, it is not fundamentally an age problem. It is a systemic problem. What is that Systemic problem? It is the problem of Impunity, of bad government. We have given to the most egregious lawbreakers across Africa, both the power and the responsibility of arresting, convicting and jailing themselves. This class suicide is of course never going to happen. The fish of Africa is rotting from its head. What is the Systemic solution? By empowering the man in the street above the man in power, the domestic Bribecode initiative and the continental Superstate initiative inoculates our legal systems against impunity and guarantee good governance across Africa. More on this later. Our various Restructure Trains must be understood for what they truly are: like earlier trains, they are engines driven by vocal intellectuals, sometimes hired, sometimes well-intentioned, dragging along the masses with no sense of history, on tracks laid by corrupt politicians and leading to a destination of milk and honey – for politicians only. It is great in theory: socioeconomic improvement will happen when powers devolves from London to Lagos with independence, or from Nairobi to Nakuru with restructuring. But in reality, our borders, and our governments are colonial constructs, and even if saints were put in to replace the colonists, those structures were designed to exploit the people and in time, freedom fighters will end up life presidents and founders of colonial dynasties from Lome to Malabo to Kinshasha. It is our duty as thinkers, to tinker with the system so that the powers of state are rescued from families like the Obiangs, Kabilas and Eyademas, and other entrenched cliques and godfathers who trade the batons of power across Africa. The resources of state must be invested in the interests of the 1.3 billion citizens and 3000 ethnic nations on the African continent. That is our duty. That is the goal of good governance and should be the true purpose of restructuring. From Lagos to Juba, from Nairobi to Bujumbura, millions of citizens of different tongues and faiths languish in circumstances that have not changed significantly in a century. Voiceless citizens for whom roads, schools, markets and electricity are budgeted annually, and embezzled annually. Their fate was not much improved by independence, ‘democracy’ or military dictatorship. It will be no different, with mere political restructuring. Before we raid the Constitution in search of more powers for states, local governments, regions or secessionists, we must ask why the powers and resources already “at the grassroots” serve a clique of the few rather than the interests of the many. Clamouring for political restructuring is a little like fetching water from a well. We may want to dig another well to meet our water needs, but our first step must be to replace the basket we currently use to fetch water with a bucket. A hundred more oil wells will not be enough to provide chalk in primary schools, if our governors and oil commissioners are kleptomaniacs with their fangs in the pipelines. Our first and overwhelming problem is good governance. If we can make serious corruption history by creating a system that guarantees that public power and resources are always used for the public good, we would have replaced the basket we were using to fetch water with a bucket, so that further trips to the well will deliver more resources to the people, rather than kickbacks to the few. Without the guarantee of good governance that effectively subordinates public officers to the Constitution and the citizenry, restructuring, whether by way of confederation, regionalism, secession, unitarianism or even theocracy will be more deceptive a mirage than independence was. Africa should indeed be restructured, but a corrupt and self-seeking political class is incapable of restructuring African countries in the public interest. Before the political (or pork-barrel, jobs-for-the-boys) restructuring, what we need is the restructuring of our governance system to give the institutions of Superstate Africa oversight over the constituent states on the continent. Validation for this view lies in the role of Ecowas and Nigeria’s antiquated warship in the termination of the Yaya Jahmeh’s 22-year-old life presidency. We will also recall how both President Uhuru and Raila Odinga appealed to the Mbeki-headed AU team in the aftermath of the recent elections. Clearly there is a need for supra-national level institutions to intervene in the life and death crises and the war and peace issues of our civilisations. The main defenders of the concept of sovereignty are apologists of the oppressors currently in the seat of power. But if we agree that the fundamental purpose of the exercise of state power in Africa today are the 3,000 ethnic peoples of 1.3 billion citizens, rather than the 50-odd ruling families and cliques then it is not hard to see that the task before the ‘freedom fighters’ of this generation is to elevate the interests of the sovereign 1.3 billion citizens above their home-grown colonists. Yet, our African Union is not quite the Superstate. Indeed it is often dismissed as an old boys club which waves off the most egregious travesties of their member states as ‘internal affairs’. Our challenge is to configure a Superstate Africa that is not merely another corruptible level of African bureaucracy. Our plan is will build up from the Bribecode initiative, which democratizes and privatizes anticorruption enforcement, introduces competitive prosecution, and punishes serious corruption and abuse of office with economic ruin. Full details are available at bribecode.org. By strengthening citizens against the captured state and her institutions, impunity is caged. The core object of the Bribecode is to restructure power relations so that no power blocs can abuse state resources, however powerful. With that systemic change to our governance model, any African country can operate any political framework, and optimize or restructure it successfully in the public interest. Yesterday, I was at a Nairobi bakery at closing time and a shop girl was packing up their unsold loaves and pastry for a motherless babies home. Humane society always defend their most vulnerable, and all humans are vulnerable at some point. Each African state consists of citizens and nations. Nigeria has a hundred and eighty million citizens and some 370 ethnic nations and cultures. Kenya has some 38 million citizens and 44 ethnic nations and cultures. Somaliland has some 4 million citizens and one ethnic nation and culture. The continent of Africa has 1.3 billion citizens and 3,000 ethnic nations split between 55 countries. In order to rest the ghost of Biafra past, each and every one of those citizens and cultures must be protected and nurtured by a system designed for people, not for rulers. But when a family or ruling class has so colonised a country, while pauperising her citizens and peoples, the effective power of the rest of the continent must be available for the liberation of that captured state. It is our duty to develop those institutions. This is how to soften the borders in an African Superstate. And this is the road to exorcising the ghost of Biafra past. This is beautiful, this should be taught to every young person. Next Next post: Orlando Pirates Players join Zukiswa Wanner at World Read Aloud Day?